With the latest beta update, WhatsApp has received a new featured aimed at improving privacy and fighting spammers – that too without hurting their sentiments. 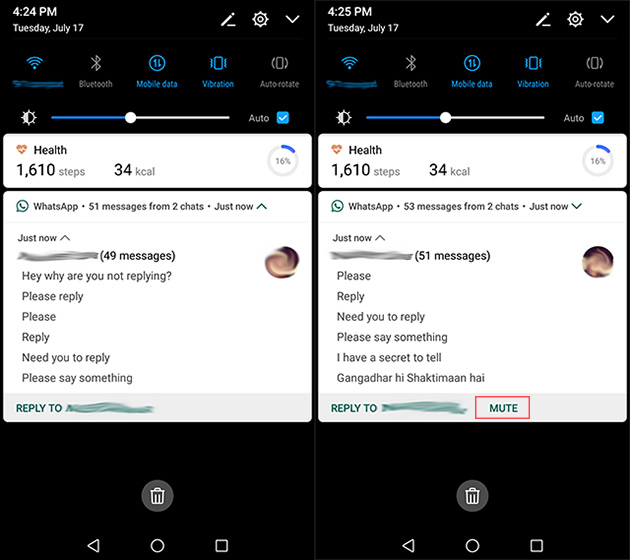 With the version 2.18.216, WhatsApp beta is getting a new “Mute” feature which will allow users to mute notifications from individual contact directly from the notification panel. WhatsApp already allows users to reply to any message directly from notifications. But the new Mute button will be useful for users in shutting off unwanted notifications. The feature, however, allows users to mute conversations only after they have received 51 messages from the same person. This is somewhat of a setback as you’d have to bear 51 (probably annoying) messages before you can mute notifications from the sender. It is entirely clear why WhatsApp is choosing the yardstick of 51 messages because by then, one would instead choose to either mute the sender or even block them out of frustration. But considering that the feature has landed in beta, the stable version of WhatsApp might receive it in a more refined form. It is possible that the limit will be reduced while WhatsApp might also allow users to choose this number manually. For now, the only pragmatic use of this feature is the ability to mute someone’s pesky messages without appearing online. Furthermore, WABetaInfo suggests that this button could be complemented by another, “Mark as Read” shortcut button in the future. Meanwhile, WhatsApp has been working on adding stickers, much like the ones available in Facebook Messenger, Skype, Allo and some other messengers. These were first announced during Facebook’s F8 conference back in May but WABetaInfo has revealed that the feature is supposed to arrive soon. There is no set date for the release yet but the publication teases two unreleased sticker packs, namely “Unchi & Rollie” and “Bibimbap Friends”. It is possible that WhatsApp might receive some of the sticker packs already available in Facebook Messenger, but that is a pure speculation.